Your doctor will likely ask you to follow a clear liquid diet when you have an episode of pancreatitis. Your pancreas produces several enzymes that aid digestion. When it becomes inflamed, avoiding solid food gives your digestive system a rest and your pancreas time to heal. Severe pancreatitis may require hospital admission, after which a clear liquid diet is often the first meal plan. Call your doctor and dietitian if you're having an episode and follow their dietary instructions to the letter. A clear liquid diet keeps you hydrated, provides electrolytes like sodium and potassium, and supplies energy from calories when you're unable to eat a regular diet. It consists of liquids you can see through. Because it is not nutritionally complete, you'll stay on it for only a few days -- no more than 3 to 5 -- according to Arizona Digestive Health. After that your doctor will advance you to the next phase -- typically a soft diet -- before returning you to your regular diet. Along with water, acceptable clear fluids include fruit juices, sports drinks, flavored water, Italian ice and plain gelatin. You can also purchase a clear liquid nutritional supplement that contains vitamins and minerals to boost your nutrient intake. 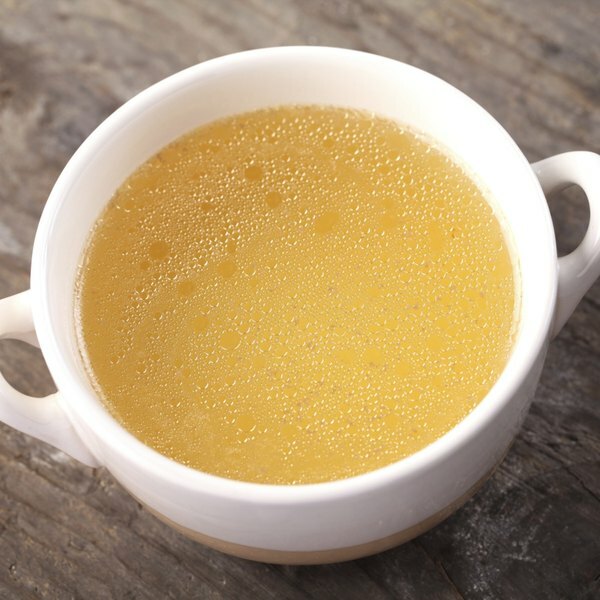 If you're craving a warm meal, have clear, fat-free vegetable, chicken or beef broth. Other allowed liquids are tea, coffee, honey, hard candies, ice pops and clear sodas like ginger ale, if you can tolerate carbonated beverages. Check with your dietitian if you're unsure whether a specific liquid is allowed. Your doctor may limit certain liquids depending on the severity of your condition. Avoid all fruit nectars -- fresh and canned -- as well as liquids with pulp or fruit bits. Alcohol is completely off-limits because it irritates the digestive system. In addition, milk is not allowed on a clear liquid diet. Other liquids to avoid are tomato soup, tomato juice, pudding, ice cream and hot or cold chocolate. On a clear liquid plan, you'll get anywhere from 600 to 1,300 calories daily, depending on what you eat and how often you eat. A sample breakfast on this plan is a cup of gelatin, a cup of fruit juice and some tea with lemon. A typical lunch is a cup of clear chicken broth, 1/2 cup of Italian ice and 2 cups of a sports drink. A sample dinner is a cup of beef broth, two ice pops and 1/2 cup of gelatin. You can snack on clear nutritional supplement drinks between meals. Can You Drink Coffee With a Gluten Free Diet? Which Foods Can You Eat on the Optifast Diet?